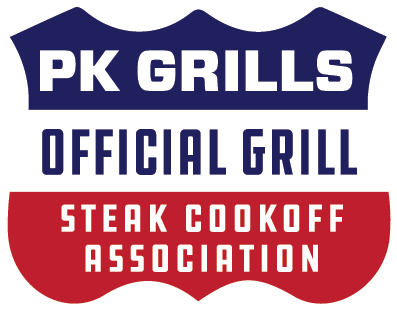 LITTLE ROCK, February 14, 2018 -- Portable Kitchen’s Inc., and the Steak Cookoff Association announced today that the PK Grill ® has been named the Official Grill of the Steak Cookoff Association for the 2018 competition cooking season. In recent years, the Original PK Grill & Smoker and the company’s new flagship PK360 Grill & Smoker have become extremely popular among the competition steak cooks who will compete in up to 175 individual events this year in the US and worldwide. The first aluminum Portable Kitchen grill capsule was designed and produced in 1950s Texas. Made entirely of aluminum, these quirky grills didn’t rust while also being extremely efficient conductors of heat. Because they had four vents, instead of the standard two, they could do dual purpose as a grill or a smoker. The PK Grill ® , as the product came to be known, quickly made a name for itself as a portable, reliable and long lasting option for grilling and smoking. The grills proved extremely durable and many of the 50’s era originals are still in use. The Steak Cookoff Association was founded in the fall of 2013 and held 18 events that year in 3 states. In just 4 short years, the SCA has grown to over 2500 members and will hold 175 events in 32 states and 14 countries across the world. "PK has quickly become the go to grill for many at SCA competitions and the SCA is proud to officially partner with PK Grills for the 2018 season." said Ken Phillips, Co-founder Steak Cookoff Association. To learn more about PK Grills or to become a dealer or affiliate visit www.pkgrills.com.